CES just wrapped up in Las Vegas. The event, which takes place yearly, is where the cutting edge of consumer products are shown off. This year had a clear theme - getting everyday consumer products connected and equipped with voice interfaces. Refrigerators, mirrors, toilets, televisions, cars, you name it, people are putting voice into it. We aren’t here to tell you that all of those gadgets are necessary, but we can say that the age of voice interface is ramping up. It is no longer in the early adopter stage as Amazon has now sold more than 10 million Alexa powered Echo products. The market for voice products is no longer a 1 horse race, as Google has put a dent in what was once an Alexa only market. In Q4 of 2017 it was reported that 7.6 million Google Home products sold, that is more than the total smart speakers sold in all of 2016. That is a massive amount of hardware. 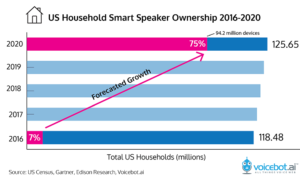 Reports indicate that 2018 will be even bigger for the purchase of smart speakers, with an estimated 56 million speakers to ship. These voice assistants aren’t exclusive to their companies hardware though. Google, for example, has their voice assistant on phones and a lot of the new connected products that were shown off at CES. Reports say that Google’s voice assistant is now available on over 400 million devices! This is an exciting time to be involved in Voice. It can be a seamless and satisfying way to interact with a computer. Over the holidays, the team at Bluefin did a fun in-house project, developing a Google Action for our kegerator. We had previously built a connected keg, powered by the open-source Kegbot Arduino, and Raspberry Pi software. A flow meter collects data on the kegs use and a web interface lets the user give input details about the keg, such as beer type and size of the keg. Since Google Assistant isn’t restricted to one device, the information is available on any device with Google Assistant. In the office, we use our Google Home to ask the kegbot questions, like “When was the last beer poured,” but we can also access it on a phone with Google Assistant enabled. Imagine you are at a liquor store, and can’t remember if the keg is low, you simply ask the voice assistant, “How much beer is left in the keg?” With what we were able to do in a week with our in house project, the possibilities seem endless for how helpful voice integration will be.